We will call or send you an email to let you know when applications have been assigned to you. You need to log in to the portal to view and assess these applications. Under this heading you will see the assessments that are assigned to you. Each assessment displays the date it is due to be submitted by, a reference number, the name of the applicant, a description of the project and the type of funding applied for. Click on the assessment you want to view; this will open the assessment record. Click to open the application/proposal and supporting information. They will open online or be downloaded to your computer for you to view, depending on the format type. If the applicant has submitted support material in a format that is not available online, eg books, DVDs, we will courier these to you. To complete your assessment you need to select a score between zero and seven for each assessment question. Questions you have not scored will be marked ? . Once you have selected a score, this icon will change to show your score #/# . Tip: You can click on these icons to expand and minimise each question. First, read the full question text; for example 'How: The process – Allocate a mark based on your confidence in the viability of the process and planned evaluation'. Next, click on ‘View assessment scale’ under the question text to open the scale for each question. Then, select your score from the drop-down list. There are spaces for you to provide comments relating to each question, as well as a space at the end for any other general comments you would like to mke about the application. Your comments are extremely useful to staff for panel discussion and feedback to applicants. When you have completed your assessment, tick the box at the end to confirm your comments and scores have been guided by the assessment scales provided. Remember to save your work regularly by clicking ‘Save’ in the top right-hand corner. 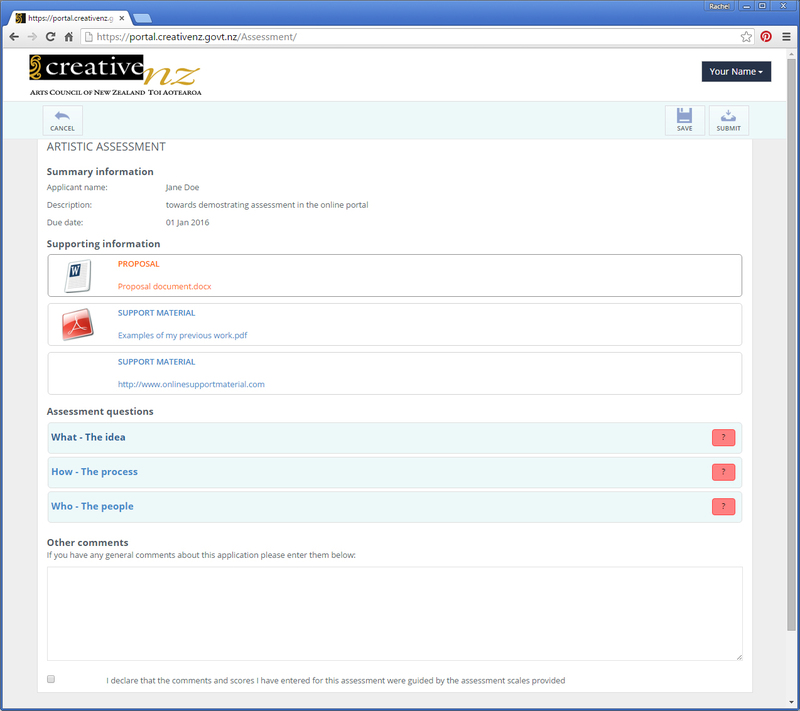 When you submit an assessment it becomes read only and you cannot edit it, so you may prefer to complete and save all of your assessments before submitting them to Creative New Zealand. Note - You need to ‘Save’ any changes you have made before you click ‘Submit’. You need to select from drop down lists to complete your assessment. If you can not see a drop down list then the device or internet browser you are using is not compatible with the portal. We recommend using one of the latest versions of Chrome, Firefox or Internet Explorer as your internet browser and that you access the portal using a laptop or computer as the portal is not fully compatible with smartphones or tablets.